We've completed a RoadMap for a client, but now their situation has changed. Can we just make changes to the RoadMap? The short answer to this question is no. But, let us explain the all important why. Think of a RoadMap like a tax return. A client makes Medicare choices at a moment in time for specific reasons. For example, a person may put off Medicare enrollment because he's still working. A RoadMap will document the details of the client's situation at that moment, including steps to take to enroll (or delay) Medicare, etc. This information will then serve as a vital reference in the years to come, helping a person to remember why certain decisions were made. It can even serve as legal documentation. When a person's situation changes (he is going to retire and give up employer-provided coverage), you do not go back and alter that RoadMap — just as you do not got back and change tax returns from two or three years ago because your income in the current year has changed. The historic look-back is still accurate and very important to maintain. Instead, a person creates a new RoadMap for the current point in time. 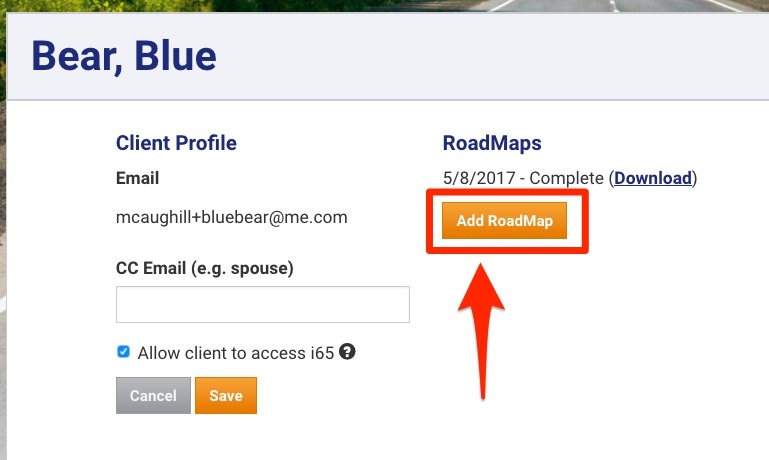 To add a new RoadMap for an existing client, simply log into i65 and head to the "RoadMaps" section of the software. Find the client you need to add a RoadMap for from the list of clients and click on the gray "View" button. 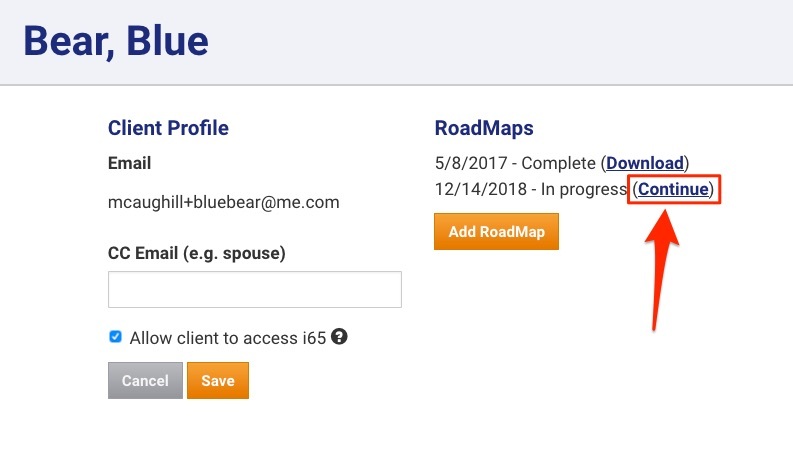 If you've completed a client RoadMap with a significant error in it (Example: You chose Option 1 instead of Option 2), you can contact i65 Support. Complete the form letting our support team know what has happened, and we will work to recify the situation to the best of our ability.